The Re:Vision Drug Policy Network is in need of new leadership: is that you? The Re:Vision Drug Policy Network is a national network of young people speaking for effective drug policies based on the ideas of human welfare and human rights. We are seeking to empower all young people aged 16-25 to campaign for effective drug policies, control and regulation, and harm reduction methods. The Drug War is fought in the name of youth, so it is essential that we as young people argue for an end to punitive, harmful drug laws. The war on drugs has failed, and it”s time to move on. Want to get involved? What does Re:Vision stand for? 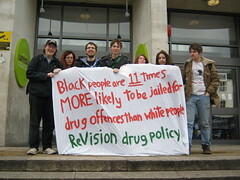 We believe that drug use is a health issue rather than one of criminal justice, just like tobacco and alcohol use is. Instead of persecuting people with drug problems, we think the role of society is to help them, and instead of allowing gangs to flourish in an unregulated drug market while prosecuting low-level dealers, we think drug sale should be brought under a legal and regulated framework that would greatly reduce criminal activity. As activists, we try to engage people, organisations, and the media in debate about current drug laws and to challenge the prejudice surrounding it. We run stalls, film showings, talks, workshops, protest, and discussion groups. We make leaflets, posters, artwork, videos, and banners. We use all and any means at our disposal to get our message out there. We are entirely reliant on volunteers to advocate effective drug policy to young people and the wider public, so please contact us if you would like to join our campaign. Re:Vision does not condone or condemn the use of drugs; we believe in promoting a drug policy which is grounded in rational debate, and one which reduces the harms of drugs instead of increasing them.